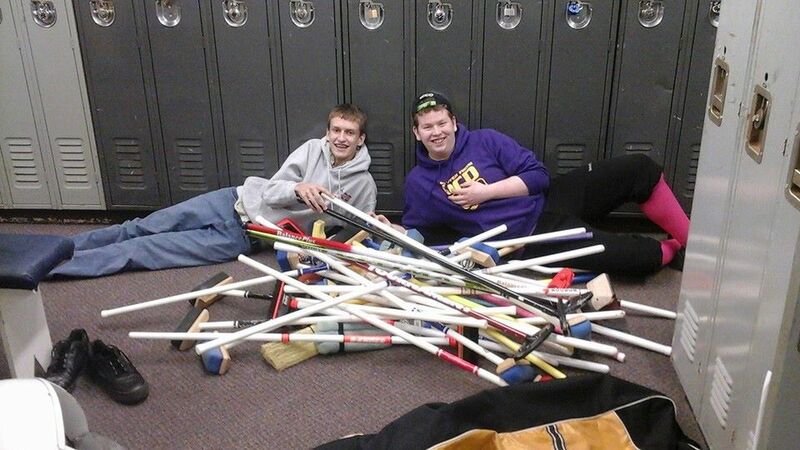 Anyone interested in a quick game of curling, with no sweeping? Sturling is a fast paced game that gives you the opportunity to practice your delivery and shot making skills, without the stress of going up and down the ice sweeping. A great way to get some practice while enjoying the game you love. Best part is a game only takes an hour to play! interested??? contact the club for more details. Here we are into 2019! Wow time is flying. 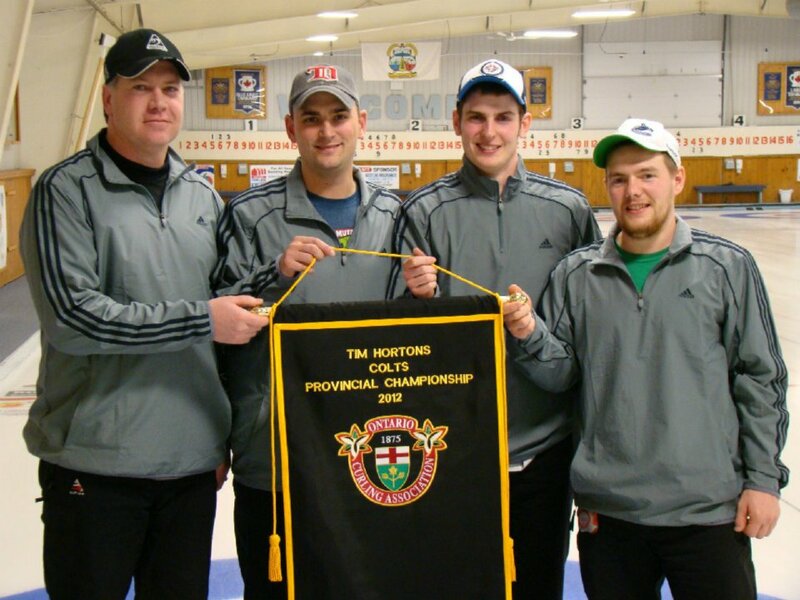 The Learn to Curl program is done for another year. If you are interested in this program, please contact the club. Our Leagues are back on the ice and as typical for the winter months, we are in need of spares. So if you are not traveling south, please put your name down on the sign up sheet. 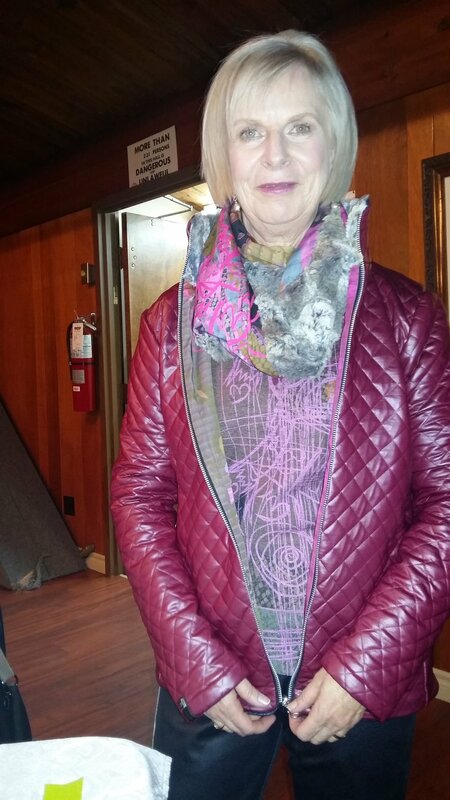 Our President Deanna has Friday nights buzzing- Thames River String Band is coming back this week, Trivia night is the following week and don’t forget the fun times on the ice. 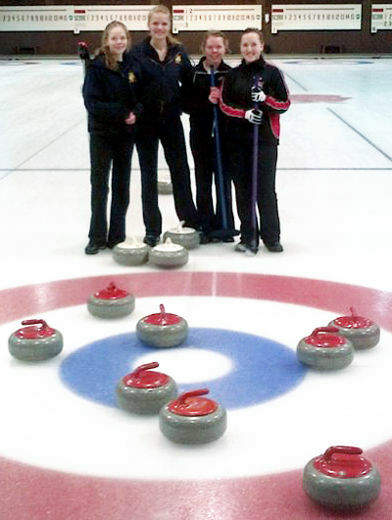 Contact the club to sign up for our ‘Pay as you Play’ curling on Friday nights. Always open to the public and a great way to try the sport. 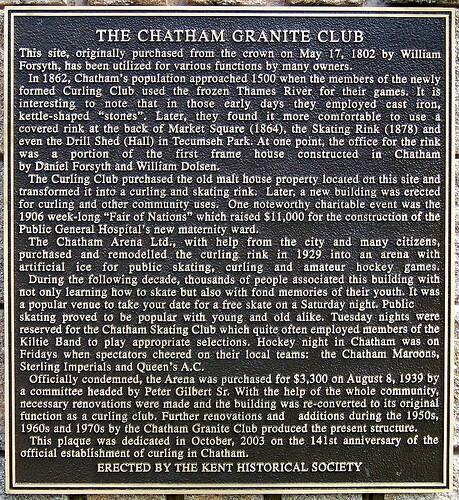 Celebrating our 156th season along the Thames River, the Chatham Granite Club has five sheets of pristine modern curling ice, change rooms with lockers and a licensed lounge facility with fully equipped kitchen. Our lounge is air conditioned and available yearly for functions such as business meetings, showers, weddings, and parties. 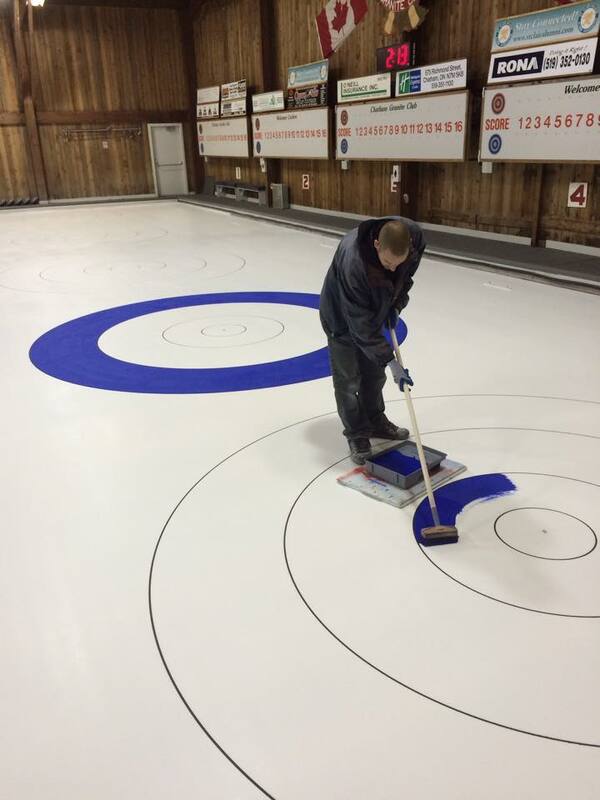 The Chatham Granite Club also operates a fully stocked Goldline© pro shop for all of your curling equipment needs. 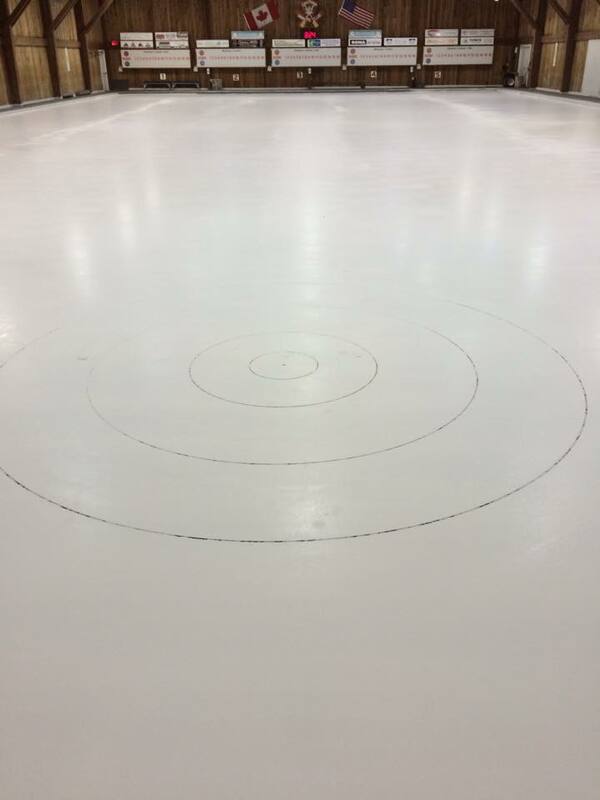 Our ice conditions are quick and curly, just like professional ice today. We are proud to have brand new technology in our ice plant. Our ice is professionally maintained and considered "the best in Southern Ontario" as well is competed on at a provincial level. Our rocks are conditioned to provide fresh striking bands and a late breaking point. The ice rink, built in 1962 is completely housed under original British Columbia Cedar. Come curl with us! 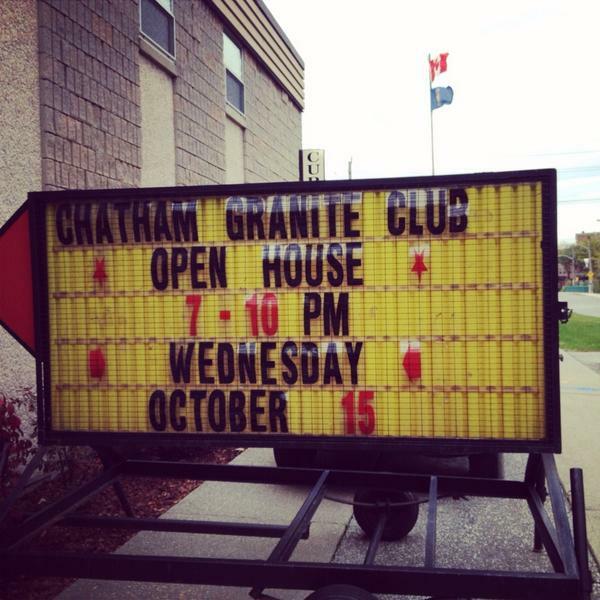 Chatham ON – On Saturday, the Chatham Granite club welcomed members of the community to an open house and ribbon-cutting ceremony to mark the completion of major drainage and structural work. The club has been an active member of the community for over 156 years. 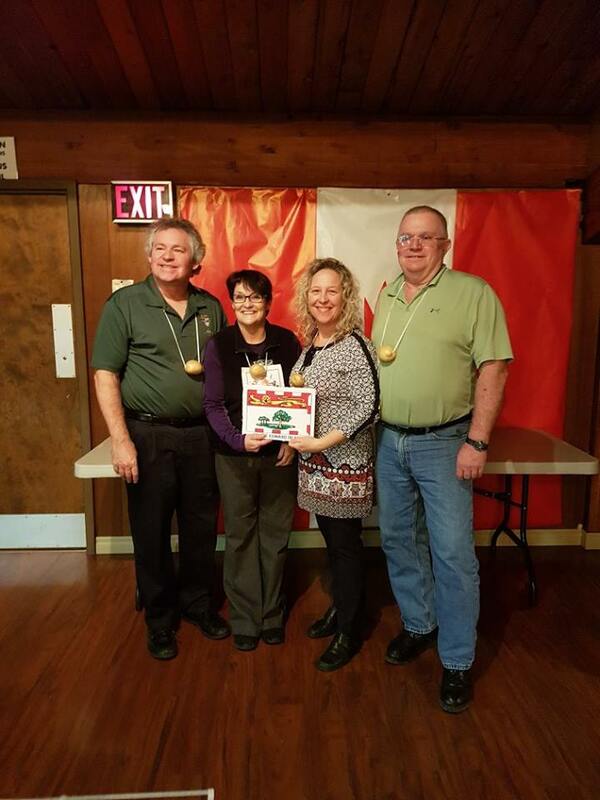 Local MPP Rick Nicolls and OTF Grant Review Team member Kathy Biondi were on hand to congratulate the Curling Club’s members and hear how the $59,400 Capital Grant is making a difference. The drainage issue was causing damage to the structure and affecting the ability to maintain the ice. With last year’s flooding, the main pipes that supply the coolant to freeze the ice were almost destroyed. Now, with even this year’s rains storms, no damages were reported. 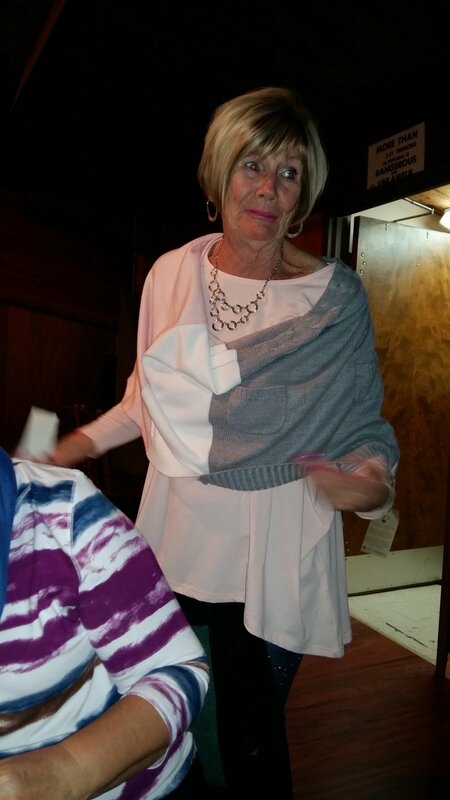 “The impact of this Ontario Trillium Foundation grant cannot be underestimated” said Deanna Bullard, president of the Chatham Granite club. This grant has allowed us to complete the needed renovations and allowed us to provide the community with ice to curl on and a sound structure to enjoy. The Ontario Trillium Foundation (OTF) is an agency of the Government of Ontario, and one of Canada’s leading grant foundations. OTF awarded more than $120 million to some 700 projects last year to build healthy and vibrant communities in Ontario. This will help us to improve our drainage and make the necessary repairs to protect the building from rain water. 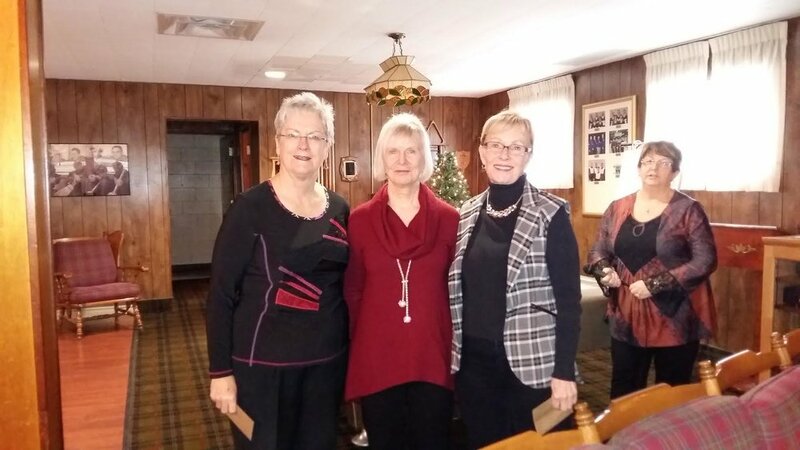 Thank you to the talented Day Ladies for their help in decorating the club not just for Christmas, but throughout the year! In case you didn’t notice …. the ladies change room received a minor upgrade with the help of Bill Park, Alfred Schneider, Peter Barlow, Jim Brodie and Craig Atkinson committee. Looks great, thank you to all involved. New LED lights over the ice. We think the brightness is much more consistent over the whole rink. Thank you to Craig Atkinson, Bill Patterson, Aiden and Ken Poole for their help. The event was a huge success! In no small part due to the many volunteers from our club and all of the curling clubs in our area. A huge Thank You to all involved in helping to make this a success. Sportsnet, curlers and spectators alike enjoyed the event. Nothing but positive comments on the set up, ice, entertainment, food and beer service and all of the ambassadors of the event. a typical comment from a team…..
A wonderful time had by all, Thanks. We are eagerly awaiting the financial results. 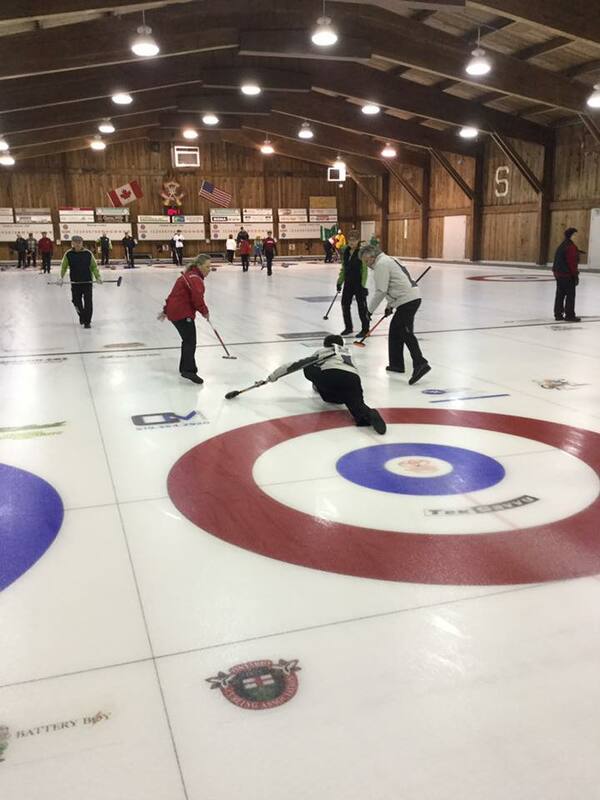 Fred Rose, known in curling circles for providing a Newfoundland brand of hospitality, has used his connections to bring an elite level curling event to Chatham-Kent. 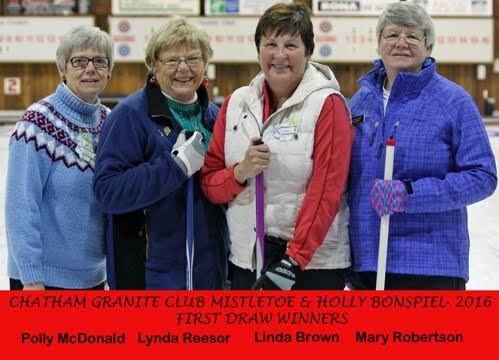 Now retired and living in Chatham, Rose has run several top-notch curling events in Gander and St. John's, and decided to lead the charge to bring the the Pinty's Grand Slam of Curling Elite 10 event here this September. “Retirement and I don't agree, so I had to find something else to do,” he said during a launch for the event on Thursday that will bring the top 10 men and women curling teams in the world to Chatham's Thames Campus Arena Sept. 26-30. “I never really lost the enthusiasm and I never really lost the high that you get from getting involved in something like this,” Rose said. 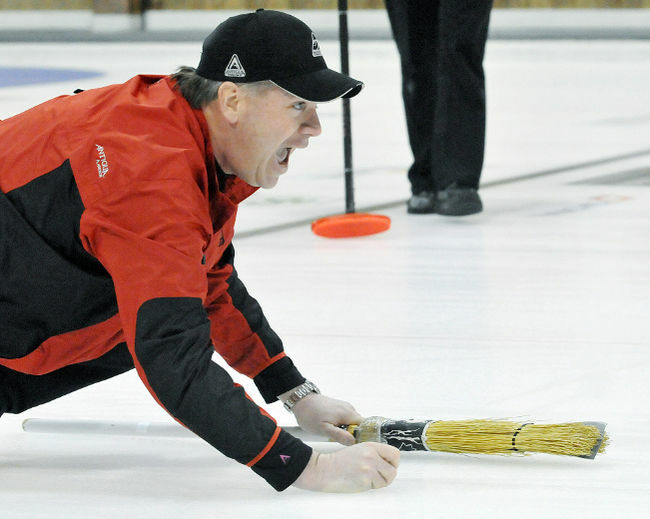 Canadian curling legend, now Pinty's Grand Slam of Curling ambassador and Sportsnet curling commentator, Kevin Martin told local media Rose contacted him over a year ago about coming to Chatham-Kent. He said the eight-end, five-rock rule makes for some interesting curling. “It's just a little bit different than a traditional amateur event, it's a lot more free-wheeling, a lot more exciting in the building,” Martin said. The tricky part is picking just one game to watch, because they are all good, since only the top 10 teams are in the event, he added. Martin said with this being the first big event of the curling season, fans will have the first opportunity to see teams, which have made some changes since last season, play together. He noted that will be the case with the Jennifer Jones rink. Martin said the Pinty's Lounge will also provide fans an opportunity to get up close to these elite curlers. “The experience we had with these people in Gander and St. John's and every other place . 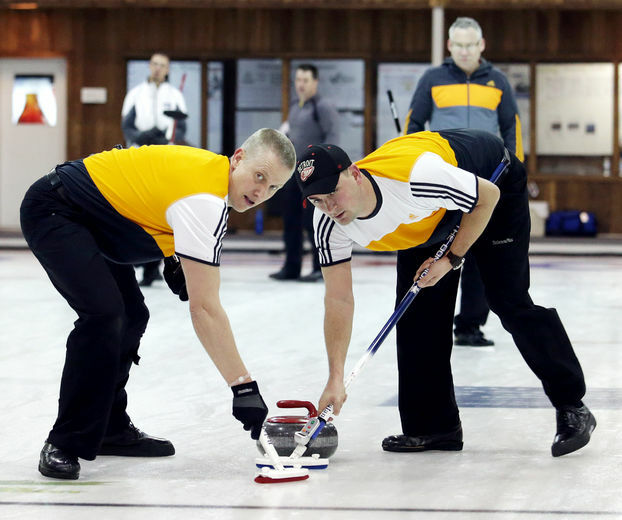 . . these (curlers) they reach out, they like to speak with people,” he said. Mayor Randy Hope, who attended the launch, said one of the benefits from hosting this Grand Slam of Curling is the exposure the community receive from the millions of people who will watch it being broadcast on Sportsnet. Hope said seeing these elite curlers can also be an inspiration for some. 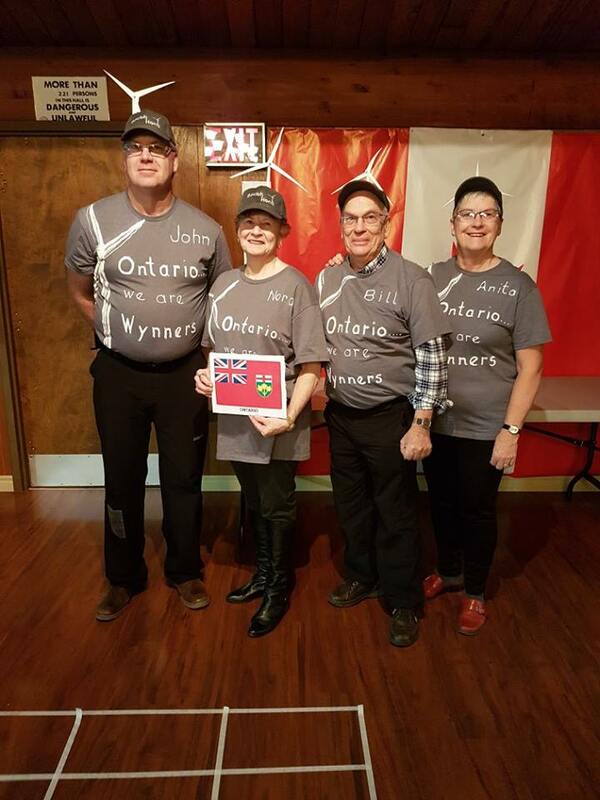 “It might be that avenue for people to say, 'Maybe I'm going to try that sport,' and become actively involved and support local curling clubs,” he said. 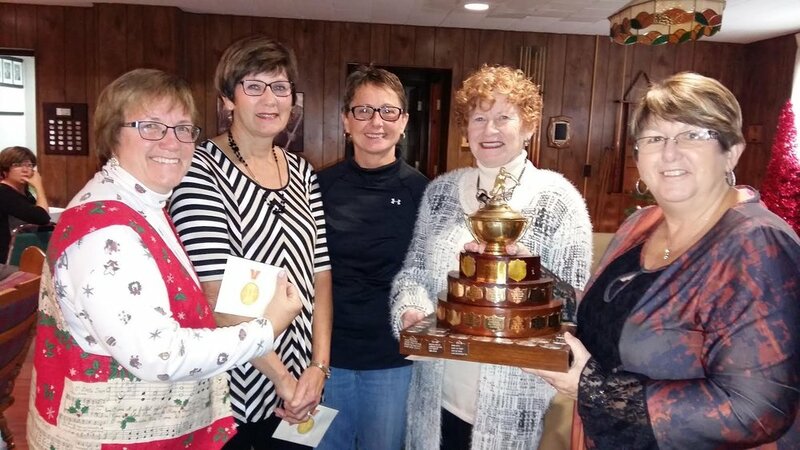 He said the Granite Club has involved curling clubs from Wallaceburg, Blenheim and Ridgetown, who will share in the profits based on their involvement and input. 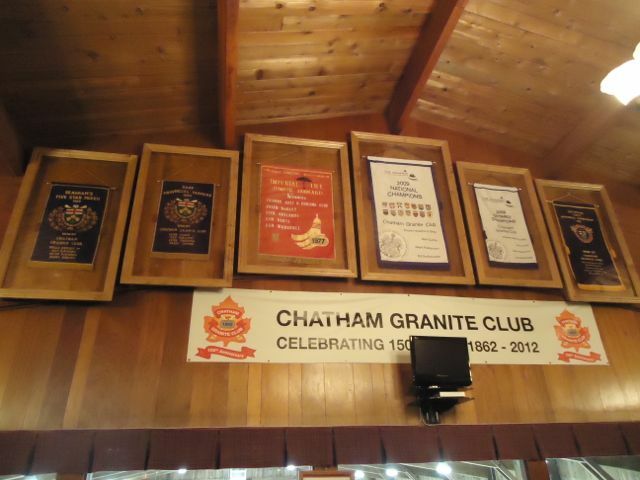 Rose said Chatham-Kent could have a chance to host even larger curling events if it had a twin pad arena. 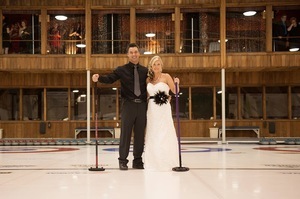 More details on the schedule and purchasing tickets are available at www.thegrandslamofcurling.com.